Yet this excitement was only a fleeting joy. A major turn of events took place in 2006. It was the reorganization of the United Nations. The Human Rights Commission was to be restructured as a new organization, the Human Rights Council, while at the same time the sub-commission was to be abolished. Due to this restructuring, the Commission (sub-committee) members who had shown understanding of our intention were all transferred to a different post. In addition, this strengthened the authority of government representatives and weakened the voices of NGOs, such as the Nippon Foundation. I was disappointed that all our efforts so far would go up in smoke, but that was no reason to give up now! If the influence of the government representatives is going to be stronger, it crossed my mind that the Japanese Government could play an important role here. With this in my mind, I approached the Ministry of Foreign Affairs and strongly requested that they become involved in this issue. The Japanese government answered my expectations and approached the United Nations. At long last, “Leprosy and Human Rights” was to be taken up as the second agenda to be discussed after “The Rights of Indigenous People.” Certainly, this speedy result was due to the efforts of the Japanese Government as there are numerous agenda that the UNHRC must address. 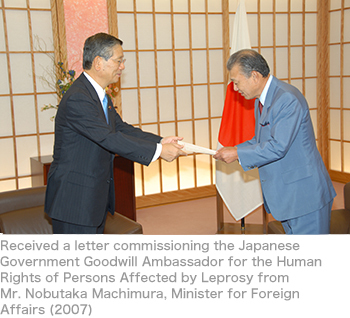 In 2007, the Japanese Government announced its decision to position the “appeal to the international community to abolish discrimination towards leprosy” as one of the pillars of Japanese diplomacy. I was appointed “Japanese Government Goodwill Ambassador for the Human Rights of People Affected by Leprosy,” a position that is central to this government initiative. In active support of this appointment and my work, the then Ambassador Ichiro Fujisaki of the Permanent Mission of Japan to the United Nations in Geneva requested that “Leprosy and Human Rights” be taken up at the plenary session of the Human Rights Council. Our activities at the United Nations, which seemed to have gone back to square one, had now become fully established with the cooperation of the Japanese Government. Moreover, the Japanese Government submitted a resolution to the Human Rights Council for the “Elimination of discrimination against people affected by leprosy and their family members.” However, given that “human rights” is an issue closely intertwined with personal interests and political positions, reaching a consensus and adopting the resolution would not be easy. Therefore, I decided to personally visit and persuade the key members of the Council, together with Mr. Akio Inomata, the then Minister Councilor of the Japanese Permanent Mission in Geneva. Among my visits, Cuba and China are two countries that strongly remain in my memory. The two countries had always objected to the proposals of the Japanese Government, which made me suspect that it would be useless to try to explain it to them. But believing that where there is no dialogue, there is no understanding, I visited the ambassadors of the two countries. How did the visits turn out? To be continued in Column 5.